This ‘How to Taste Scotch’ page is a continuation from our Hosting a Scotch Tasting Party article. 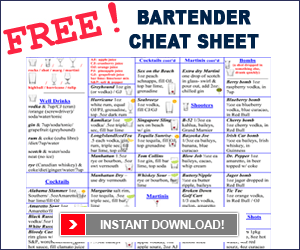 Once you have everything set up for your scotch tasting event and you have all your supplies and you’ve downloaded and printed copies our our scotch tasting sheet, you’re ready to learn all about how to taste scotch. As we go through learning how to taste scotch, there will be 2 stages of tasting with 5 levels to complete. The first level will be to explore the scotch neat – meaning no water added and at room temperature. The second level is to explore the scotch diluted – with a little water added (approximately 1-1½ ounces of water). The water used for diluting the scotch should be free of heavy minerals. Bottled spring water is the best option. The 5 degrees of scotch tasting is the same for both stages. Step 1: Once each guest has been poured a “dram” of scotch (approxiamately 1½ ounces), instruct guests to hold their scotch glasses by the stem. Have everyone hold their glasses up to the light to observe its color. The color of the scotch will reveal what kind of cask it matured in and how long it matured for. They may refer to their scotch tasting sheet to identify the cask. Step 2: Have your guests tilt and rotate their glasses to coat the sides of the glass with the scotch and look at the legs. The legs are what we refer to as the liquid that runs back down the side of the glass. How the legs move and the speed at which they run indicates the maturity of the whisky. Slower legs equates to older scotch. Step 3: Before tasting the whisky, have your guests nose their scotch to detect the complexities and aromas. During each of these steps, your guests should consult their scotch tasting sheet and write down what they observe. Step 4: Now comes the actual tasting. Guests should only take into their mouth enough scotch to coat their tongue. They should then let the scotch sit on their tongue for a minute so they can scrutinize its flavours and texture. Now instruct your guests to swallow the Scotch and observe and assess its finish. Get your guests to make note of the flavors that linger on their tongue. Holding the glass by the bowl will warm the scotch up and change the taste and aromas. Tasters may want to try an extra tasting using this method and compare their observations between the two. Step 5: Lastly, add a little water to enhance the characteristics of the scotch. Now repeat the steps of observing, smelling, feeling, tasting and assessing the finish. Now everyone can compare notes from the first neat (no water, no ice) tasting and their second tasting where water was added. Once each selected scotch has been sampled, serve some desserts and have your guests mingle and share their findings with each other, discussing what they liked best. 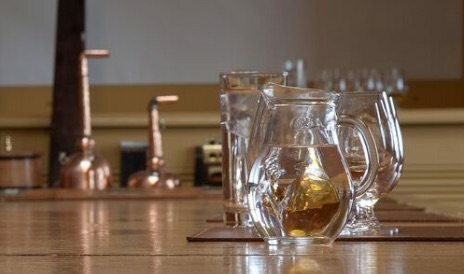 We hope you enjoyed How to Taste Scotch and you’re brimming with ideas on hosting a Scotch Tasting Party of your own. 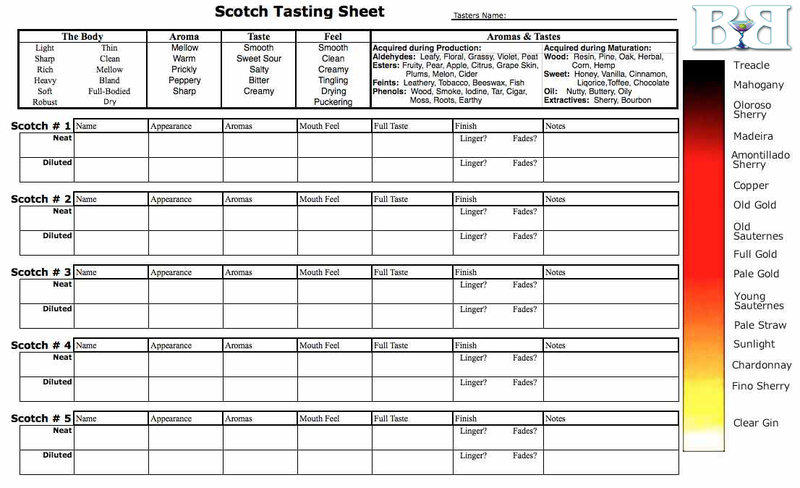 Don’t forget to download and print out enough copies of our Scotch Tasting Sheet for your party. If you liked the article, please show some bartending love by liking, commenting and sharing. Cheers!